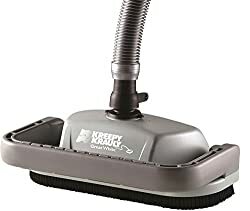 A suction pool cleaner attaches to an existing skimmer and filtration system in order to extract debris from surface pool water just like a vacuum for carpets. 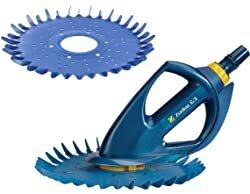 Suction cleaners are great for removing finer debris and for leaves that collect at the bottom of swimming pools. Some suction pool cleaners even have scrubbing abilities. With so many suction pool cleaner options out there, deciphering what is the best suction style pool cleaner for your needs can become challenging. The type of suction pool cleaner you purchase must work on your pool surface whether it is for Pebble Tec, fiberglass, vinyl, concrete etc. Since a suction pool cleaner is dependent on an existing pump and filtration system, its performance and efficiency vary depending on the condition and reliability of the existing system. Maintenance of the entire pool system is essential for gaining optimum performance from the cleaner. We now look at some of the best suction based cleaners available on the market based on features, benefits, price, service and warranty. The Pool Cleaner’s four-wheel drive gives it the power to clear obstacles seamlessly without getting stuck on drains or corners. It works efficiently in shallow to deep pools and climbs up walls, leaving no spots for you to clean manually. There is no built-in filter to clean, no electrical connections to maintain and very few moving pieces to replace which makes it a good investment for the money. One of the most versatile pool cleaner – it works for large pools, dive pools, lap pools, even older pools regardless of their shape and size. XtremepowerUS is one of the most affordable pool vacuum cleaners in the in-ground pool cleaning category. This particular suction pool cleaner is better designed to pick on micro dirt and algae rather than large debris or leaves. It comes with an adjustable hose length which makes it easier to position around the pool. For the size and weight, this machine is easy to transport and operate. You can expect premium service without a hitch for close to two years with no extra tools needed. The Baracuda G3 is easy to install and use. It is extremely durable as it has only one moving part. No complicated gears, wheels or a flapper means it’s simple to operate and requires low to zero maintenance. This versatile cleaner has the ability to work on all types of pool surfaces. It is ideal for in-ground pools and removes all kinds of finer debris as well as smaller leaves. Another great feature of this product is that it effortlessly adjusts to the flow of the water which builds up performance. What’s important is that this cleaner is reliable and of high quality. The Aquabug is designed to clean permanently-installed above-ground pools of all surfaces, shapes, and sizes. Installing this pool cleaner is a straightforward 10-minute process that helps save hours of frustration and backbreaking work. Its pre-programmed steering system helps it get into corners, climb walls and steps leaving no spot uncleaned and leaving you relaxed and cool. Aquabug cleans small dirt and debris very well, so much so that you’ll never need to manually empty and clean debris bags. This bug also improves water circulation keeping your pool cleaner for longer without overusing alternate chemicals. The Intex Auto Pool cleaner is a perfect vacuum for above ground, Intex pool owners. It is efficient in cleaning the surface of your pool of dirt and debris using little more than your existing filtration system. The automated feature allows the bot to get on with hard work while you relax and enjoy. This suction pool cleaner does quite a lot of heavy lifting for its price. 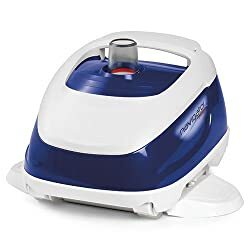 This cool looking suction bot is one of the most reliable and sturdy units on the market today and at quite a reasonable price. 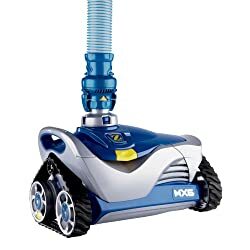 Its large rubber tires and impressive suction capacity allows this bot to climb up walls and sweep across pool floors in no time leaving behind clean debris free pool water. A popular and recommended choice of many pool geeks this bot is a beast when it comes to sucking up dirt, grime, sand, leaves, algae and pretty much anything else you could throw at it. The Hayward Navigator is the dinosaur of suction pool cleaners and this new model is just as dependable as the old ones. The perfect automatic suction pool cleaner for gunite pools that has the ability to climb walls, stairs and get into areas you just didn’t think possible. The excellent warranty terms and fair price make this the ideal choice for gunite pool owners when it comes to keeping their beautiful pool sparkling clean. This new model Pentair Kreepy Krauly is the ideal suction pool cleaner for most pool types. The new design features big flappers around the base that collects debris and pushes it up against a one-inch vacuum hose resulting in a fast and efficient cleanup of dirt, sand, leaves, algae and other forms of small debris. The Pentair 360042 is an affordable lightweight suction pool cleaner that will keep any small to large size pool looking clean with minimal effort. The Hayward AquaNaut comes in two sizes. The size 200 is great for smaller pools while the size 400 is ideal for larger in-ground and above-ground pools. The 200 may look small but it has a large appetite for debris. 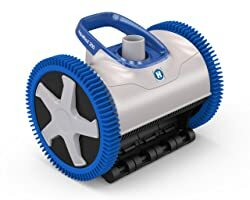 This little bot thanks to AquaNaut’s V-flex technology is able to pass leaves, twigs, pebbles, dirt, and grime all through the cleaner leaving your pool looking cleaner than ever even after the worst storms. Its beautiful simplistic design and application ensures that it performs as well as it looks. 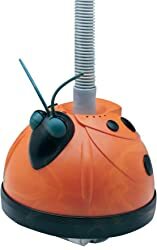 The Pentair Kreepy Krauly is an automatic in-ground pool cleaner that works both as a vacuum and a scrubber. 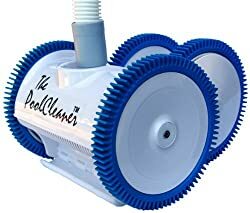 Thanks to its bristle drive mechanism this hungry pool cleaner is able to scrub of the toughest contaminants and dirt from pool floors leaving pool water looking clean and clear. The Pentair is a popular suction pool cleaner as it is easy to set up and has the ability to attach to pretty much any existing pump or skimmer. 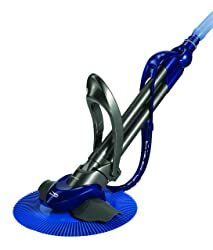 Its 15-inch wide scrubbing ability is what really differentiates this product from the rest of its competitors. Many suction pool cleaners are built specifically for certain pool surfaces. Making sure that you purchase one that is suitable for your pool surface whether it be vinyl, concrete, Pebble Tec, fiberglass etc. is extremely important. Hoses can be a nuisance and especially annoying when it leads to your pool cleaner being tangled up or develops leaks. Quality hoses are made from materials that are more resilient to wear and tear. Wheeled suction pool cleaners are for climbing walls whereas suction pool cleaners with flappers usually trawl across the pool floor sucking up debris just like a catfish. Suction pool cleaners that are equipped with bristles or brushes are better cleaners as they are able to scrub of contaminants and dirt from pool surfaces. Any automated suction pool cleaner should have excellent climbing abilities so that it can do a thorough cleaning job all around the pool including the floor, sides of the wall, waterline and even stairs. Pool cleaners are expensive and thus it is important that the one you plan on purchasing is made from tough, durable materials that can take the wear and tear of hard work. Features like programmable timers and intelligent navigation systems make vacuuming large or small pools hassle-free. Ensuring that the cleaning and maintenance process is fairly simple and cost-effective is also an important factor to consider when making a purchase decision. What is the best suction pool cleaner? After reviewing ten of the best suction pool cleaners it is safe to say that the best suction pool cleaner is one that best suits a customer’s individual needs. However, the zodiac is perhaps the best all-round suction cleaner available in the market today. The Zodiac MX 6 has a beautiful design matched with powerful performance. 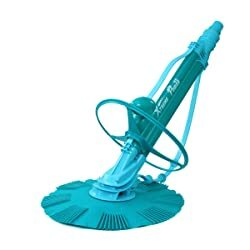 Its sturdy body and legendary reliability makes this the ideal suction pump for sucking up all kinds of debris including leaves, algae, dirt, sand, grime, bugs etc. 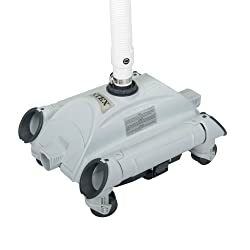 This suction pump works on any pool and on any surface whether it is vinyl, Pebble Tec or fiberglass; this will vacuum all the debris it can get its wheels on. Highly recommended by pool professionals and experts.